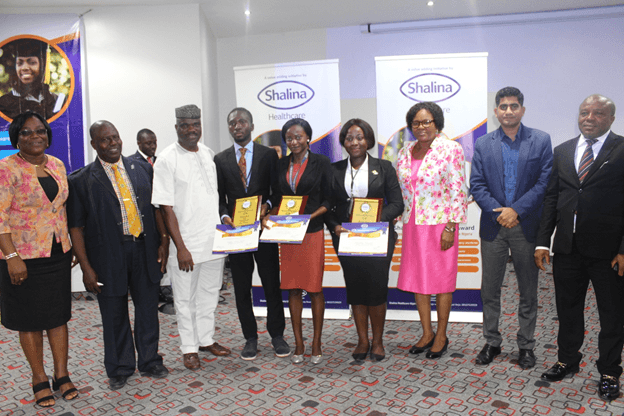 Folashade Salako, a final year student of the Faculty of Pharmacy, Obafemi Awolowo University (OAU), has been declared as the best Pharmacy brain in the country after clinching the 2019 Shalina Young Talent Award (SYTA). After three fiercely fought competitive regional rounds at University of Ibadan, Faculty of Pharmacy, OAU Ife and Faculty of Pharmacy UNILAG, the grand finale of the competition, took place at Ibis Hotel, Ikeja, Lagos, on 8 April 2019. The contest saw young Salako cutting an edge over two other contestants from Faculty of Pharmacy, University of Ibadan (UI) – Temiwunmi Akinmuleya, and Adeboye Bamgboye, to second and third places respectively. L-R: Pharm. Samuel Adekola, national chairman, Association of Community Practice of Nigeria (ACPN); Dr Gbola Olayiwola, senior lecturer, Department of Clinical Pharmacy, OAU; Folashade Salako, winner, Shalina Young Talent Award (SYTA); Somnath Malakar, managing director- Shalina Healthcare Nigeria Ltd; Dr Rahul Mandlik, head, medical marketing, Shalina Healthcare, Dubai and Pharm. Folorunsho Alaran, marketing manager (West Africa), Shalina Healthcare. It was more of a horse race seeing nine Pharmacy students aiming to outsmart and outwit one another in a bid to win the coveted prize money at stake. Described as the biggest hunt for the best Pharmacy brain in Nigeria, SYTA proved to be a hard nut as the academic gladiators metaphorically went for one another’s jugular to garner maximum points through their arguments. Debates, case study, open presentations, clinical and pharmacological quiz, mode of dressing and comportment formed parts of the criteria that decided the eventual winner. At the end, the judges – Pharm. Samuel Adekola, national chairman, Association of Community Practice of Nigeria (ACPN); Prof. Oluwatoyin Odeku, dean, Faculty of Pharmacy, University of Ibadan (UI); Dr Gbola Olayiwola, senior lecturer, Department of Clinical Pharmacy, OAU; Dr Kingsley Amibor, national chairman, Association of Hospital and Administrative Pharmacists of Nigeria (AHAPN); Prof. Bolajoko Aina, dean, Faculty of Pharmacy, University of Lagos (UNILAG) and Dr Rahul Mandlik, head, medical marketing, Shalina Healthcare, Dubai – expressed satisfaction and commended all contestants before announcing the three winners. In reaction, Mazi Sam Ohuabunwa, president, PSN commended all the nine final-year students for good representation. In his address delivered by Pharm. Okame Okah-Arae, the PSN boss declared that it is the dream of every parent to see their children excel in everything they do, especially in education. L-R: Prof. Oluwatoyin Odeku, Dean, Faculty of Pharmacy, University of Ibadan (UI); Dr Gbola Olayiwola, Department of Clinical Pharmacy, OAU; Pharm. Samuel Adekola, national chairman, Association of Community Practice of Nigeria (ACPN); Temiwunmi Akinmuleya, 3rd prize winner; Adeboye Bamgboye, 2nd prize winner; Folashade Salako, overall winner, Shalina Young Talent Award (SYTA); Prof. Bolajoko Aina, Dean, Faculty of Pharmacy, University of Lagos (UNILAG); Dr Rahul Mandlik, head, medical marketing, Shalina Healthcare, Dubai and Dr Kingsley Amibor, national chairman, Association of Hospital and Administrative Pharmacists of Nigeria (AHAPN). “I know if your parents were to be here, they will be proud of what you have achieved today. I must commend the lecturers for molding these young brains in preparation for their future career. Kudos must also go to Shalina Healthcare for putting up this innovative programme,” he said. Speaking with Pharmanews, Dr Kingsley Amibor, national chairman, Association of Hospital and Administrative Pharmacists of Nigeria (AHAPN) applauded the initiative organised by Shalina Healthcare and clamoured for other pharmaceutical companies in Nigeria to borrow a leaf from the company. “It is not only restricted to one arm of Pharmacy practice. It encompassed all aspect of pharmaceutical care and outside the scope of pharmacy. I think it is a worthwhile programme. From what I have seen today, the students were challenged and I have no doubt that they will be encouraged to take their studies serious from now,” he noted. According to him, the contest also served as a career guidance for the students adding that many now know more about the various aspects of pharmacy they can veer into after graduation. Pharm. Adekola, seemed to share the same opinion when he congratulated Shalina Healthcare for coming up with such laudable initiative. “I have witnessed something like this in the past too. I was in my final year (part four) then. A company held a similar event, which talked about black hypertensive story. However it wasn’t as detailed and robust as the one we have here today. “Competition like this will always stimulate interest. Through this initiative, these young pharmacists would have a level of motivation and confidence that would impact a sense of excellence in them. Invariably, this would contribute significantly to quality of graduating pharmacy students,” he said. Meanwhile Somnath Malakar, managing director, Shalina Healthcare has explained that the company is working assiduously on a number of universities to engage for next year’s programme. He disclosed that at the regional level, Shalina connected directly with close to 365 contestants out of which nine finalists emerged for the grand finale. “It would be a sustainable project and we will keep investing in people who matters the most. This is one of the ways our company is reaching out to the community. “I agree that most companies start and back out of projects but that will depend on their perspectives too. We have seen a lot of benefits in this and it would make more sense to keep this project in place for the future,” he said. 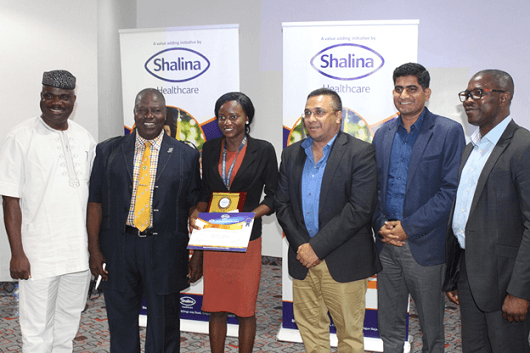 According to Folorunso Alaran, regional marketing manager (West Africa), Shalina Healthcare, SYTA initially began as an idea conceived with no particular direction but with a clear objective of purpose. “Several trips were taken to seek opinions across many schools on how best to organise an objective and flawless competition. The result of those efforts is what we have today. “It involved zonal rounds in various competing schools where each zonal champions were duly recognised and celebrated amongst their classmates. I am glad that we have eventually discovered the ‘Best Pharmacy Brain’ for the 2018-2019 Maiden Edition,” he said. The remaining contestants at the premier SYTA edition were Joedicta Ekeh, University of Lagos (UNILAG); Samson Akinola, University of Ibadan (UI); Olusanya Akanmu, OAU; Azeez Akande, UNILAG; Ibrahim Hassan, OAU; Fatoye Oluwatimilehin, UNILAG and Zainab Bamidele, UNILAG. Other dignitaries at the event included Dr Arinola Joda, senior lecturer, Faculty of Pharmacy, UNILAG; Dr Chukwuemeka Azubuike, sub dean, Faculty of Pharmacy, UNILAG; Dr Modupe Ologunagba, representing Pharm. Victoria Ukwu, national chairman, Association of Lady Pharmacists (ALPs); Pharm. Babayemi Oyekunle, secretary, Lagos PSN; Prince Ismail Adebayo, former ACPN national chairman and Pharm. Folorunsho Alaran, marketing manager (West Africa), Shalina Healthcare.